Not just a running watch, more than a sports watch – it’s the premium multisport and triathlon watch for ambitious athletes: Polar Vantage V.
A premium multisport watch designed for pro athletes – and for anyone who trains like a pro. If you’re thinking about updating your Polar V800 and wondering how Polar Vantage V compares to its predecessor, see our quick comparison list of the key features at the end of this article. But, first, let’s explore what exactly makes the new Polar Vantage V the perfect training partner for athletes who are serious about achieving their goals. When you fall in love with someone, it’s hard to pinpoint just one specific reason why – it’s the whole package that makes you fall and stay in love. There isn’t only one feature or design detail that would fully explain why the Polar Vantage V is unique. In the same way, there isn’t only one feature or design detail that would fully explain why Polar Vantage V is unique. It’s all the smart stuff inside the beautiful package (and, yes, also the actual package with robust design and premium materials). 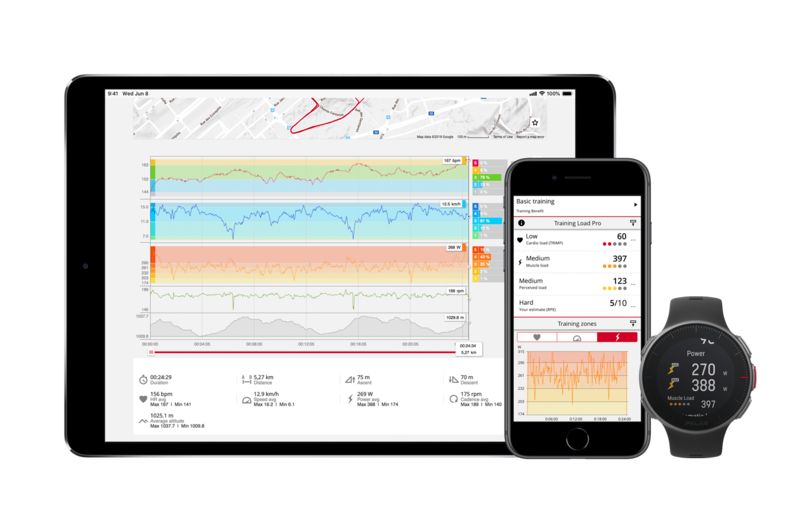 If we had to name one benefit that all new features and improvements have in common is they make it easier for pro-level athletes to track their performance and use more holistic data to balance training and recovery. That’s the big picture but the package is filled with goodies for pro-level athletes so let’s crack it open and take a closer look. Now, let’s start with heart rate measurement, which has been at the core of Polar’s solutions since the 1970s. For the athletes who have been struggling with tracking their heart rate data with a chest strap when racing, we have great news! The most accurate alternative for chest straps: Polar Precision Prime™, a cutting-edge wrist-based heart rate measurement. With the new Polar Vantage series, we’ve taken our extensive knowledge and experience from heart rate technology and used it to create the most accurate alternative for chest straps: Polar Precision Prime™, a cutting-edge wrist-based heart rate measurement. This is the only heart rate technology that uses three methods to provide accurate heart rate: nine optical channels using several colors and wavelengths of light, 3D acceleration and an electrical sensor that measures the quality of sensor-skin contact. Athletes can now monitor their heart rate reliably without a chest strap and track their heart rate straight from the wrist. This means that athletes can now monitor their heart rate reliably straight from the wrist with a faster response time, more sensitivity for readings, and much higher accuracy and reliability for wrist-based heart rate. But, the Polar Precision Prime technology doesn’t make chest-based heart rate measurement redundant because the Polar H10 heart rate sensor still provides the best heart rate accuracy, for example, for sprints, strength training and measuring recovery with the new Recovery Pro™ feature on Vantage V.
The key to balancing training and rest is learning to listen to your body and to combine your subjective feeling with data. With the Polar Vantage V you can optimize your training and recovery on a whole new pro level. The new Training Load Pro™ and Recovery Pro™ features will help you to recognize your personal limits by giving you personalized feedback and telling you whether you’ve been training too much, too little or just right. The new Training Load Pro™ feature doesn’t measure just one system of your body but three! The new Training Load Pro™ feature doesn’t measure just one system of your body but three: Cardio, Muscle and Perceived Load. Combining all three loads will give you the best understanding of your total training load and how demanding each training session is for different systems of your body. The new Recovery Pro™ feature measures your daily recovery level with the Orthostatic Test, tracks your long-term recovery and gives you feedback on how recovered you are and recommendations on when you can train again. The recovery measurement takes into account all stress factors in your life, not only stress from training. The recovery measurement is based on your heart rate and your heart rate variability, and takes into account all stress factors in your life, including stress from training and stress caused by other aspects of your life, such as poor sleep or work pressure. Polar Vantage V has over 130 different sports profiles to choose from and a multisport mode to track several sports in one training session (ahoy triathletes!). As the first sports watch to measure running power from the wrist, the Polar Vantage V paves the way into the future of running. Obviously, it’s a lot more than just a running watch, but paves the way into the future of running, being the first sports watch to measure Running Power from the wrist, calculated with Polar’s proprietary algorithm and based on your GPS and barometer data. Running Power is relatively new but it is a great tool to measure the external load of your running. It reacts faster than heart rate so it’s ideal for measuring your load for uphill running and interval sessions. You can also use it to maintain a steady effort level during your run even in varying terrain. Running Power complements heart rate measurement: when you measure both you can detect changes in your running performance. If after weeks of training you can produce the same power with lower heart rate, your running performance has improved. Polar Vantage V is lightweight (66g), compact in size (46 x 46 x 13 mm) and fits perfectly on your wrist – it’s ergonomically optimized for sports and allows your wrist to move naturally. To make the product work ideally in training as well as in daily use, the user interface has both a color touch display and buttons. The touch screen is handy, but with the buttons you can use the watch without watching (pun intended) and focus on your training. It’s as tough as they come. With a stainless steel front case and Gorilla Glass lens, Polar Vantage V is as tough as they come. To make sure, we put it through the toughest tests and tried every possible way to break it so that you wouldn’t be able to – it’s designed to last. No, of course that’s not it! We’re rolling out a number of enhancements to both Polar Vantage V and M. Check our Vantage updates page to see what we have lined up. HOW CAN I GET MY HANDS ON Polar Vantage V? Find out more and buy Polar Vantage V on the Polar webstore or get it in a store closest to you.